This concert is particularly unique because two of the pieces that will be performed include vocals to be sung by Swarthmore students, a rare occurrence according to Neu. The students who will be singing are Veronica Yabloko, Shelby Billups, Ben Warren, and Omar Camps-Kamrin. 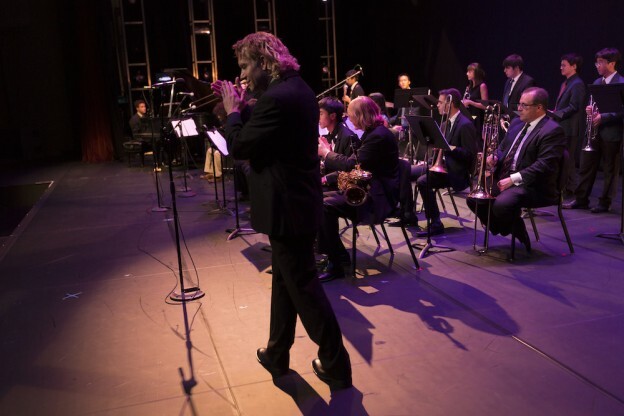 In addition to jazz standards and classics like “I’ll Remember Clifford,” “Come Rain or Come Shine,” and “Basie Straight Ahead,” the ensemble will also perform “TSC Blues,” “Fanfare for the Common Man,” “The World is a Ghetto,” pieces that were written “written exclusively for jazz ensembles.” “TSC Blues” is an original composed by Brain Pastor, a Philly locale and principal trombonist of the Philly Pops. “Fanfare for the Common Man,” arranged by Aaron Copland, is a creative, somewhat “unusual” interpretation of music originally purposed for brass and percussion. “The World is a Ghetto” is Andrew Neu’s own arrangement, which, he feels is “nothing like the original.” While the original music leans more towards being R&B, Neu’s arrangement is more “idiomatic towards a jazz ensemble,” almost resembling a jazz waltz. The event will start at 7:30 P.M. in the Lang Concert Hall, and it will be live streamed.